ALTBalaji’s Bose Dead/Alive original soundtrack out now! 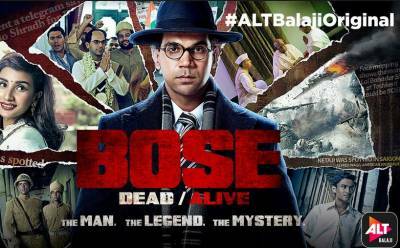 ALTBalaji’s most ambitious and anticipated digital show Bose Dead/Alive has already piqued the interest of audience with its first look and trailer. And now its title track is sure to amplify audience excitement. The fast paced, thrilling number is rendered by composer Neel Adhikari and Q (Qaushiq Mukherjee) and has been penned down by Mc Todfod and Doktorgandu. The title track Bose is available for streaming on websites - Hungama, Gaana and Saavn. Neel Adhikari is known for his work in Brahman Naman and Saheb Bibi Golaam; while Q has done films like Gandu and Tasher Desh. The song is quite gripping and keeps the audience on the edge, while setting a perfect background for the show. Creative Producer of Bose Dead/Alive, Hansal Mehta speaking about the song said, “We wanted the Bose soundtrack to reflect the spirit of Bose. The track had to be subversive, a ‘cool’ anthem of protest and something that would represent the thriller that Bose’s life journey was. I’ve been a huge fan of Q, both for his films and his music. I was thrilled when he came onboard with Neel Adhikari to make this track. He has rapped his heart out for this number. It is such a cool composition, so edgy and such an adrenaline rush!. ALTBalaji’s Bose Dead/Alive starring Rajkummar Rao will trace the journey of the freedom fighter from being an introverted 14-year-old to a 48-year-old brave nationalist. This fast-paced thriller will soon be streaming on ALTBalaji.